This week’s Sister Spotlight features our very own Hanna “AquamarinE” Primana! Hanna has worked hard as a sister serving on major board as our vice president as well as minor board, as publications chair and culture chair, and excelled at them! Part of our Charismatic Chi class of Spring 2016, she is our photogenic and artsy sister whose Instagram is aesthetic goals. 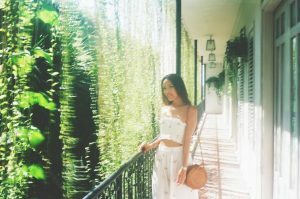 Learn more about her love for her Indonesian heritage and how Sigma positively impacted her college experience! Question 1: You are very proud and vocal about your love for your Indonesian heritage. Could you tell us a little bit more about what you are most proud of to be Indonesian and what people who are not too familiar with Indonesian Culture, should know about it? I think what a lot of people don’t know is how diverse the country is. What I love the most is our motto “Bhinekka Tunggal Ika” which directly translates to “Unity in Diversity.” We have over 300 ethnic groups with different cuisines, cultures, religions, languages, traditional wear, and I think it’s pretty cool. If people ask me “What’s an authentic Indonesian dish?” I can’t really answer because there are thousands of dishes and each dish is unique to a specific region, so you would need to ask me “What’s an authentic dish in *insert specific Indonesian region*?” The way they prepare the food, what spices they use, and how they cook their meals are very different. For example, where I’m from, we use a lot of sweet spices such as brown sugar, so a lot of the dishes tend to be sweet, but the regions in the North are more spicy and peppery. There are so many spices that are readily available outside of the country, which makes cooking Indonesian meals extremely difficult in America. Our culture is vibrant, traditional, and modest. We adapt it from different places, India, Southeast Asia, China, and even the Netherlands. We are however, unique in our own way. We have heritages and traditions that I cannot explain without writing a book, but let’s just put it this way: to experience Indonesia, you need to experience it’s diversity and it’s people (and food, DUH. But that goes without saying). Question 2: You are very talented with art (photography, digital design, painting, etc.) When and how did you develop your interest? Where do you get your inspiration for your designs, color schemes, for your artistic work? I’ve always been interested in art since I was 3, when I had my drawing classes. I remember my first drawing was of a ballerina. My mom actually framed it and it’s in our house back home! That was when I was first introduced to art. These drawing classes slowly turned into painting classes when I was around 10 and to digital art when I was in Junior High. I was just exposed to all these different mediums and soon my interest became a passion. In the summer of 2012, I also did an intense fine arts course in Boston University which was equivalent to a 4 college credit course. I took IB (International Baccalaureate) Art in Higher Level where I had to make 10 artworks in 2 years, also including it’s process, from inspiration to brainstorming to reflection and analysis in my journal. I had my first exhibition at the end of my senior year of high school. Now, I get my inspiration literally everywhere: from fashion blogs, to restaurant menus, book covers, event posters. I think my style comes from modern culture with vibrant colors, albeit with a more minimalistic look. Question 3: What do you enjoy most about being a sister of Sigma Psi Zeta? Just like what I enjoy most about home, I enjoy the diversity of Sigma Psi Zeta. We literally have sisters from everywhere and I think that expands my knowledge for other countries and cultures. I enjoy trying and learning how to cook meals from different sisters and just talking about each other’s different but rich experiences through life. I enjoy the sisters, on top of everything. The company, the support, and the warmth each sister gives me and it is truly a home away from home. Question 4: Can you describe the similarities and differences between your life in Jakarta, Indonesia versus your life in the States? There are no similarities at all. Differences include, being more independent living without my family. I need to take care of my own finances, need to make travel arrangements alone, and do all the decision-making myself and trust that I make the best judgment for myself. There is also no one to clean up after my mess, to help me cook, so everything I do is more individualistic. Being back home, I need to think about my sisters and my parents. I can’t just do something by myself, I have to ask my parents for permission, little things like that. Food is also very much different. All the food here is very different to the food back home. Even the Italian food here isn’t that great in my opinion because the Italian food back home is adjusted to my tongue and preference. Lastly, lifestyle – I can’t really go out to eat so often because eating out here is very expensive compared to eating out back home, the way I dress is also very different and just how I spend my time here and back home is very different too. Question 5: With the experience and relationships that you have formed during your time here at GW, what do you feel has been the most valuable part of your college experience, thus far? It is definitely meeting people – from classes, to networking events, to Greek orgs. People have definitely made my college experience valuable. I think it is amazing how I started from being a loner my first semester to having events almost every week, if not every week. People make life interesting and I believe that this applies to myself, 100%. I surround myself with amazing people who lift me up and support me through it all, and I wouldn’t have it any other way.